Willie Woodburn was once described as an enigma. Wrapped inside this enigma was a scapegoat of the Scottish Football Association's draconian disciplinary system. His story taught thousands a Latin phrase, except 'sine die' didn't sound like a learn-it-by-rote classroom clause. It was much more than that. It sounded like the end. To many, Willie Woodburn was sine die. He defined it. This was more than just a misguided presumption: Woodburn took the full brunt of a broadsword wielded by a footballing body swayed not by reason but by some indefinable sense of 'duty'. By doing so he made it easy for those who followed in his wake. 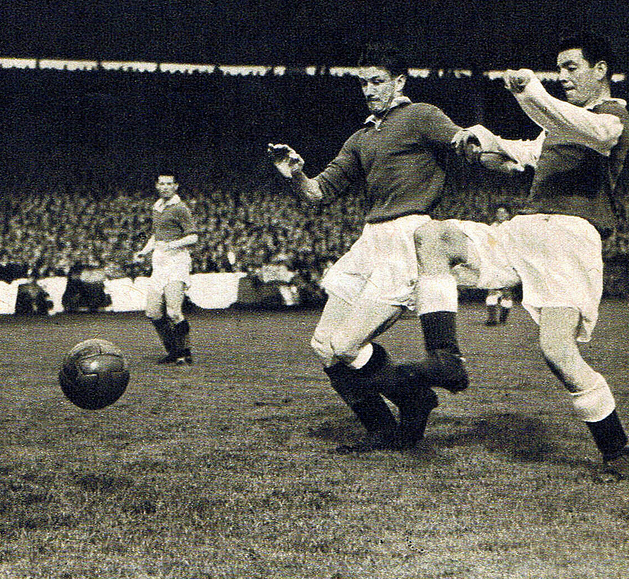 Luis Suarez can take note – Willie Woodburn was – is – the last great victim of football's puritan disciplinary power broker. 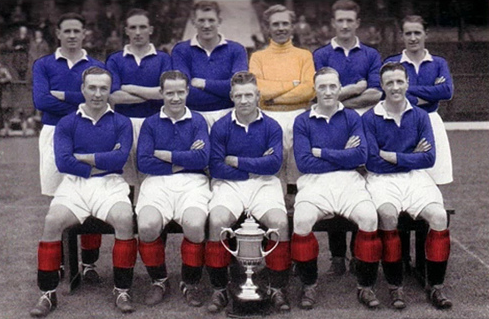 Between 1938 and 1954, Woodburn played 325 games for Rangers, scoring a solitary goal. He won four League Titles, four Scottish Cups and Two League Cups; three Doubles and a Treble, and he was capped 24 times for Scotland. Such facts and figures are easily disposed of by a fading memory. Tragically, the stigma of sine die would live with Woodburn forever. Woodburn first walked through the gates of Ibrox as a player in October 1937. Though he had played juvenile football with Edinburgh Ashton and hailed from the capital (he supported Hearts as a boy), Woodburn was immediately a Rangers man. It was his first Club, and his last. He was well liked by the Ibrox fraternity, who later Christened him 'Big Ben'. 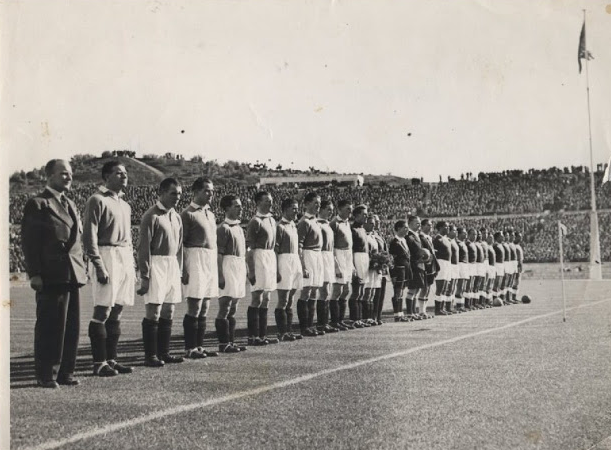 Not as you might expect in tribute to his size and reliability, but as a result of Woodburn's impassioned and prolonged celebration of a Rangers victory over Benfica in Lisbon in 1948. With a joyful innocence that typified his deep love of winning, insisted on raising his glass every few minutes and bellowing : 'Viva Benfica!' His chant continued through the night and into the next day, and the Rangers players felt his performance merited some kind of permanent commemoration. So Big Ben it was. Far from being a prototype bruiser, in his early days at Rangers the sinewy, beautifully balanced Woodburn was criticised for dallying on the ball too long, keen on proving himself to the Ibrox idols as a 'player', when really all manager Bill Struth wanted was a human brick wall. "You've got the juvenile habit of holding the ball in the penalty area and inviting trouble," Struth told Woodburn after the 19 year old's first Old Firm derby had ended in heavy defeat for Rangers by 6 goals to 2. "All we expect of you here is that you clear your lines. Leave the wing-halves to play the football." Woodburn found himself able to absorb only a diluted version of Struth's advice. Although he developed a sticking economy in his play, he remained a footballing centre-half, a breed unheard of in 1940s and 50s Scotland. "Woodburn for me was a guy that could have played in the modern game," says Alex Willoughby, a wispy striker who followed his idol onto the Ibrox pitch in 1962. "Because not only could he play, he was also a guy that could organise and talk, and when you play in the middle at the back that's crucial. If you read the game well and talk well, you save your legs, because you're playing with your head. 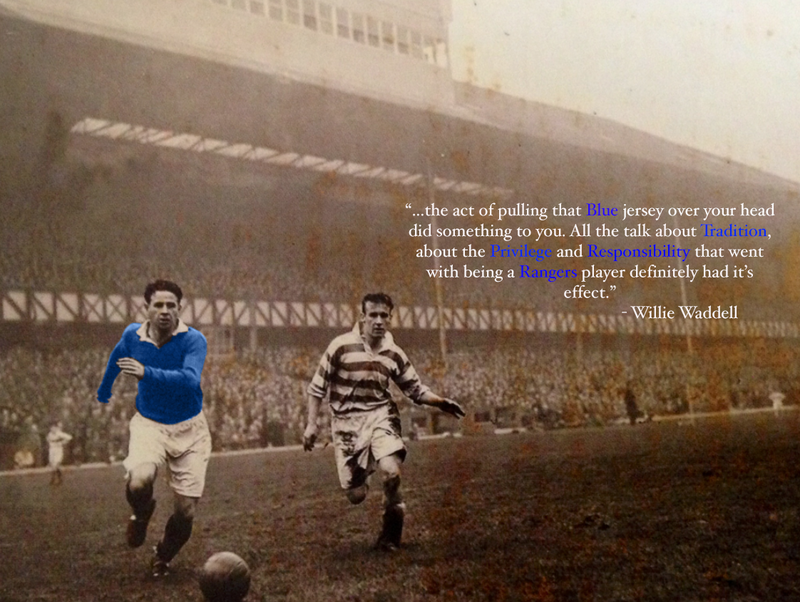 Willie was that sort of player." Ralph Brand was a starry-eyed teenage reserve at Ibrox during Woodburn's final years at the club. He said that the big man never lost his majestic poise and enviable technique. "Willie had everything," said Brand. "Apart from being one of the hardest men, he was also one of the most cultured centre-halves in the country. He could bring the ball down, or he could clear it, or he could head a first time ball to the likes of Sammy Cox. He played it with skill, which was rare because in those days centre-halves were all-out stoppers, they were chop-eaters, but Willie made you play too, because if you didn't he just played right over the top of you." During his career, Woodburn ran over some of the most distinguished heads in football. Tom Finney faced Woodburn on four occasions, and didn't forget the earth-shuddering encounters. "Willie was this towering centre half who was very, very strong in the air and on the ground," recalled the Preston North End legend. Much of Woodburn's fearsome reputation as a hothead is apocryphal. Prior to the early 1950s, this reputation held little credence. He could mix it with the best, but until 1948 – ten years into his Rangers career and aged 29 – he had never been sent off or suspended in a professional match. Still, the 'Wicked Willie' tag had mileage and the Scottish media made no apologies for pinning it to the big mans chest. "Oh, he was a hard player, he had a short fuse and people played on that," admits Finney, "but there were so many of those players about in our day, a hell of a lot. Back then, the tackle from behind was allowed and it was generally a much tougher game. You had hard men who got away with a lot. I remember games against Willie when I got hit hard, but you expected it - it was part and parcel of the game." "I think challenges were made to look a lot worse in his case," adds journalist John Quinn, "because he was such a giant. If you were 5ft 6in playing against Willie or George Young, then obviously you're going to down." Woodburn's size and command of the penalty area intimidated his opponents, and their dramatic slumps to the turf no doubt tricked many a referee into awarding decisions against him, but even his most ardent fans admit Woodburn's make-up was fundamentally flawed. One man who knew that better than most was Willie Waddell, Woodburn's friend and teammate. "He was always a fierce competitor," said Waddell, years after Woodburn's departure from the game, "but I think that basic determination was distorted by the mystique of Rangers. There is no doubt that in our time, the very act of pulling that blue jersey over your head did something to you. All the talk about tradition, about the privilege and responsibility that went with being a Rangers player, definitely had its effect. I think Willie felt it more than any of us. I am sure that obsession with winning for Rangers had a lot to do with his troubles. Still, it would be absolutely ridiculous to think of him as maliciously violent. You couldn't meet a more likeable, generous man. He could be wild, but when I was best man at his wedding I had to hold his hand through the ceremony." Sadly by the summer of 1954, the rest of the country had also come to realise the full extent of the big defenders intolerance. Woodburn already had a touch paper temper. In September of that year he found the tinder and lit the spark. It had been coming for some time. Back in August 1948, Woodburn had been involved in a 'violent exchange' with Dave Mathie, the Motherwell centre-forward, and was subsequently suspended for 14 days. That made it almost five years of unbroken good behaviour, which was undone on 7th March 1953 when Rangers played Clyde. He was sent off for aiming a swing at Clyde's Billy McPhail. He missed, and was banned for 21 days. He surely would have got a longer ban had he connected. A few months later in September 1953 came the first of two ugly confrontations with Stirling Albion. Woodburn showed that even the most undistinguished opposition were more than capable of getting a rise out of him. A chap called McBain offered up his fists to Woodburn, who retaliated with his head. A spur of the moment thing. It was a head closer to oblivion for Woodburn. The SFA banned him again, this time for 6 weeks, making it clear that "a very serious view would be taken of any subsequent action". Unfortunately for Woodburn, the SFA were as good, if not better, than their word. Almost a year later, on 28th August 1954, Woodburn was 34 years of age. Not a young man by any means, but ferociously fit. Younger players waited in the wings but there is no doubt that they would have continued to wait for a good while, especially as new manager Scot Symon described him as "the anchor of my new team." Ralph Brand watched his hero self-destruct that autumn afternoon at Ibrox against Stirling Albion. "I was at the game, sitting in the stand. Firstly what a lot of people don't understand is that Willie was nursing a knee injury and played with a strapping on his leg. In those days, you played with injuries, you didn't sit in the stand, you played for your cash and your bonus, or else somebody else got the money. Willie just declared himself fit and that was that. Stirling had a young centre-forward (Alec Paterson) who was obviously trying to make his mark. I can see the incident right in front of me even now. Willie had a few tussles with this guy during the game, and he was trying to be the big shot at Ibrox – playing against Rangers and Willie Woodburn. With about a minute to go they went for a ball together and Willie won the tackle fair and square, no problem, but as Willie was turning to go, this fellow locked his legs around Willie's injured leg and of course when Willie went to pull away he jerked his knee and aggravated his injury. It must have been sinful, but it didn't end there. On top of that, the fellow got up and stood chest to chest with Willie Woodburn, right in his face, giving it some lip. Willie Just dropped his head. Bang. I remember the whole thing so clearly. It was right on the centre line, right in front of the whole referee committee. "It was all over the papers, of course, and then it came up in front of the committee. They banned Willie sine die, which was shocking, absolutely shocking. There was no need for that. To end a great man's career like that was just unforgivable." Tom Finney well remembers the general amazement that greeted the news of Woodburn's fate. "We just couldn't believe it. It just didn't make sense at all. There was a feeling that a grave injustice had been done. I'm sure he wasn't given the help from the people with influence." Ralph Brand expands on Finney's hunch, claiming that Rangers were willfully negligent in their defence of Big Ben. 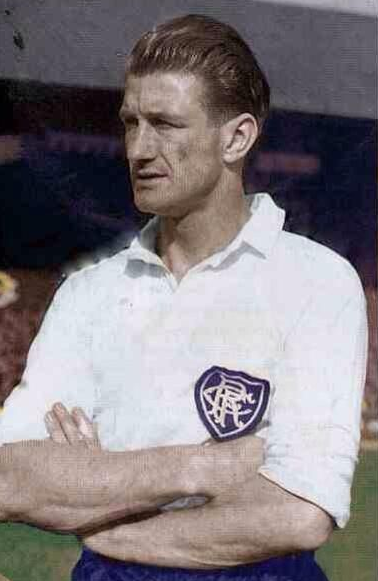 "If it had been Bill Struth that had been manager I think Willie would have remained a Rangers player. Struth was an iron man – he would have told Scottish football to away and ravel themselves, but Scot Symon was the manager and that was that." Despite Brand's thoughts, manager Scot Symon was there for Woodburn when it mattered. He waited nervously in a stark corridor as his player endured perhaps the shorter, and as it transpired, one of the most conclusive disciplinary hearings in the history of British football. "When the door of the committee opened," Symon later recalled, "one look was enough to tell me the verdict. "That's it all finished," he shrugged. "My own feelings were immediate. I felt as if 'The Castle' which once perched so proudly on top of the Ibrox grandstand had come tumbling to the ground around me." It was a shocking decision. Woodburn, Symon and the majority of Scottish football expected a reprieve, and the legal experts tried, unsuccessfully in the end, to persuade Woodburn that his case would be favourably received in the courts. John Cameron QC informed Woodburn by letter that the SFA was legally obliged by a clause in its Articles to give Woodburn a definite date on which he may "resume the right to play" and consequently earn money, despite the suspension being sine die. For 30 months, Woodburn later recalled, Cameron's letter lay in his desk. Woodburn ignored it. Instead, turning to the men he trusted and heavily swayed by his deep feelings of personal loyalty toward Rangers, Woodburn bided his time. "We don't want to take it to court" pleaded the club chairman, John Wilson. Woodburn had no desire to go where his beloved Rangers feared to tread. "The Club had been generous to me," he later wrote, "and the last thing I wanted to do was bring it into open conflict with the SFA. I was sure that after a reasonable period the ban would be lifted. I knew my offence merited a stiff punishment but when the punishment was pronounced words failed me completely. It was obvious I didn't have many years left at the top of football and the stigma of sine die was punishment enough. I had good grounds for believing that the SFA might relent after a few months. There was a top legislator who phoned me with an urgent plea not to take legal action: 'Don't do it, Willie. Things will work out for good, you'll see.'" They didn't. Woodburn appealed to the SFA every six months as was his right, but to no avail. 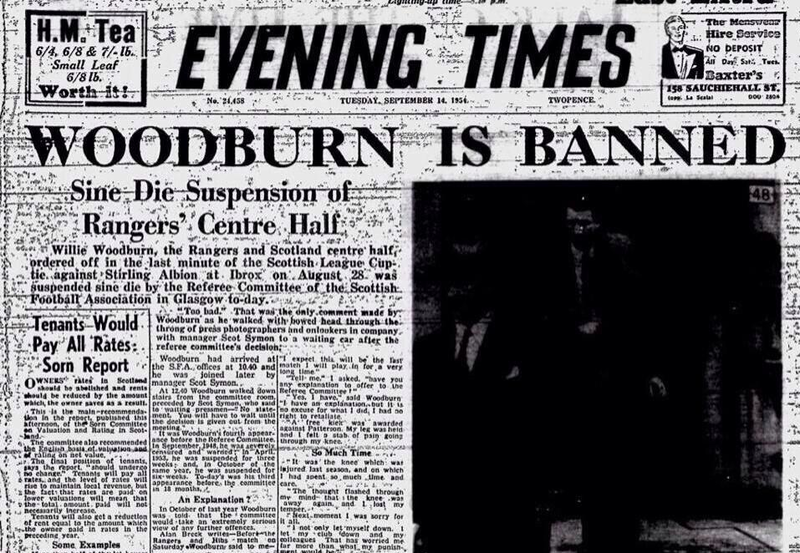 When the SFA eventually lifted Woodburn's sine die ban on 23rd April 1957 he was 38 years old. It was too late. In the midst of all the appealing and protesting and hoping, Willie Woodburn had become an ex-player. An ex-player that was never thought of or viewed as a dirty player by his peers. Time had finally taken its toll on Big Ben. "I never fancied playing for another club anyway." 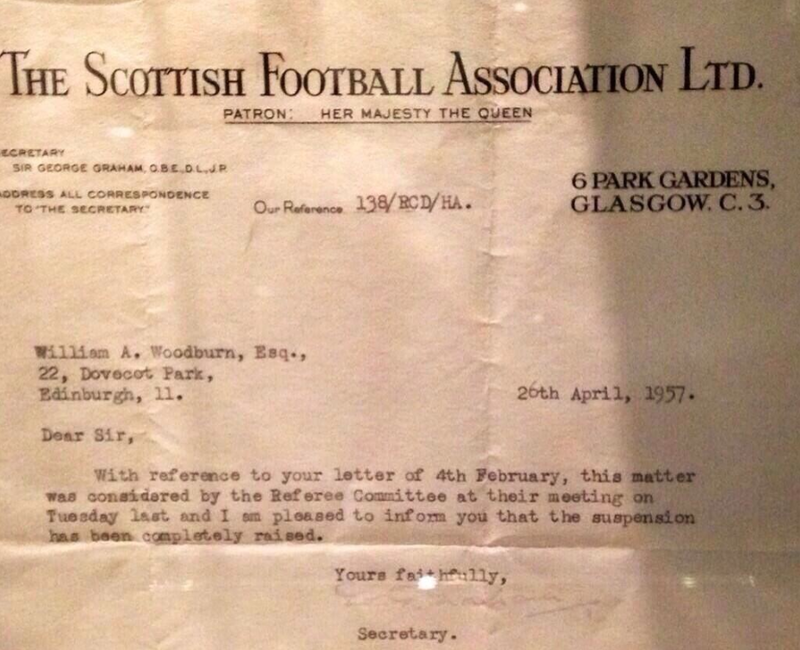 The Letter addressed to Willie Woodburn informing him that his ' sine die' suspension was over.